The government's not so into it when you accidentally make the US break international treaties. The United States government doesn’t exactly love it when you fire rogue satellites into the atmosphere without their permission. It may not have liked it, but there was legally nothing the government could do about it. In January, a company called Swarm Technologies launched four small satellites called SpaceBEEs on an Indian rocket, after the U.S. Federal Communications Commission (FCC) denied it permission to launch in the U.S. Quartz reports that the FCC has just completed an inquiry into that launch, and given its enforcement bureau permission to act on it. The FCC hasn’t yet announced how Swarm will be penalized; the agency could choose to fine the company, or even ban it and its individuals from satellite operations altogether. Unfortunately for Swarm, the FCC may choose to make an example of the company. But that’s mostly so that the U.S. doesn’t get in trouble with its allies. In April, Slate reported that Swarm’s activities could have accidentally made the U.S. noncompliant with international treaty obligations. Specifically: they may have put the U.S. in breach of the 1967 Outer Space Treaty, which says that the U.S. is responsible for the activities of its actors (that is, companies hailing from that nation) anywhere in space. And it may be liable for any damage that any satellite caused — like if, say, a SpaceBEE was knocked out of its orbit and punched a hole in another country’s satellite. This is a real threat: given how small SpaceBEEs are (10 by 10 by 2.5 cm), the FCC was indeed concerned that the company would not be able to track the little guys, or be notified if they veered off course. This was the original reason the agency denied Swarm permission to launch. The United States is also required to coordinate the radio communications of their various satellites with those of other countries, to ensure there is no interference. Because Swarm satellites will need to communicate with their central control, they’ll probably need to use some part of the radio frequency — though Swarm has not yet confirmed this publicly — but do not have an FCC license to use any. And if the coming slap from the FCC wasn’t enough? Swarm also lost a NASA contract with the Small Spacecraft Technology Program when they were denied their launch license. Quartz reports that Swarm appears to still have a “cooperative research and development agreement” to work on space debris tracking with the US Navy’s Space and Naval Warfare Systems Command, though a Navy spokesperson did not provide Quartz with any more information beyond confirming the agreement existed. 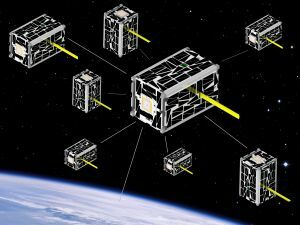 As we reported in April, the FCC is currently working on a rule-making scheme that would improve the process by which small satellites like these are approved. That new process, plus the threat that companies could face whatever it is that happens to Swarm, would make it pretty unlikely that more rogue satellites will pop up anytime soon.